Why should you always watch where you're going when this guy is around? Because one does not simply walk into Mordo. With masterful control of mystical entities and magical energies, Mordo's powers in sorcery are nearly unrivaled. 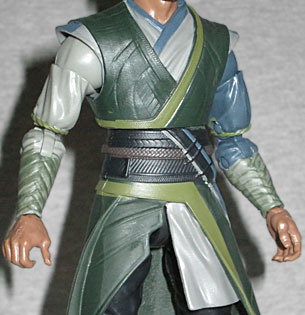 Considering that Baron Mordo is traditionally Doctor Strange's archenemy, it was surprising when it was announced that the movie had cast him as an ally. It seemed like misdirection, like he was going to be revealed as the evil mastermind in the third act and were all supposed to be surprised when it happened. It would be like creating a movie where Professor X and Magneto were teammates, or a show that had Lex Luthor and Superman as best friends in high school. Or, since those are things that actually happened, how about if Netflix's Daredevil had announced before filming that Kingpin was going to be Matt Murdock's law partner. It'd be weird, right? Same deal. 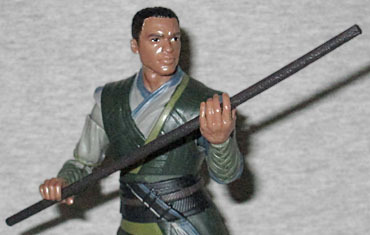 Karl Mordo was played by Chiwetel Ejiofor, so between him and Frumplebend Comeuppance, you're well on your way to a set of 12 Years a Slave action figures (just nobody tell those people who got mad at NECA, okay?). It seems probable that the movieverse Mordo is not Transylvanian, like his 616 counterpart, but the likeness of Chitlin Ejector is fairly good. 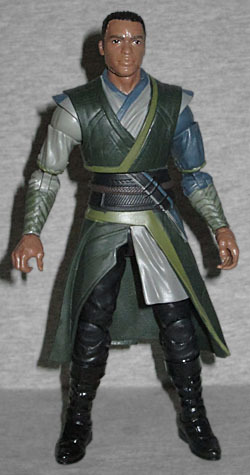 Just as Doctor Strange's usual red-and-blue costume has been successfully "real-ized" for the movie, so too has Mordo's green-and-black. He wears a multilayered robe, with the outermost bit being several tones of green, and moving down to grays and muted blues beneath that. His trousers and boots (which may or may not be the Vaulting Boots of Valtorr) are black. He has neatly ordered wrappings on his forearms, and a braided sash strapped at an angle on his waist. 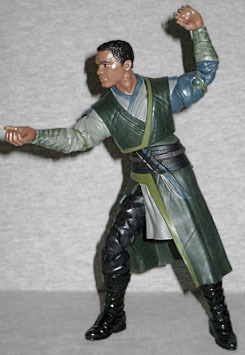 There are small details molded in the surface of the clothing, and although Mordo is not wearing his cloak, he is still ready to battle the forces of evil. To help him battle, the figure has pretty much all the articulation Hasbro has taught us to expect from a toy company in 2016: a balljointed head, hinged neck, swivel/hinge shoulders, swivel biceps, double-hinged elbows, swivel/hinge wrists, a balljoint chest, balljointed hips, swivel thighs, double-hinged knees, and swivel/hinge rocker ankles. The legs get pretty limited by his skirts, but at least he can lift both arms, right? That's more than we could say for Zangelbert Bingledack, after all! And while the hinge in his right wrist is the usual front-to-back kind, the one in his left wrist is side-to-side. Surprising! Mordo doesn't get any extra hands, nor any magic effects. He does, however, have a stick. It's just a wooden stick. In the movie he used the Staff of the Living Tribunal (which isn't anything from the comics, but neither are the Boots of Valtorr and anyway oh my god, how awesome is it that the Marvel Cinematic Universe has the frigging Living Tribunal!?! ), but it didn't look at all like that. That was a short, ornate stick that extended with mystical energies linking the sections, while this is just a straight wooden staff. Well, sort of straight: it gets bent slightly in the package. 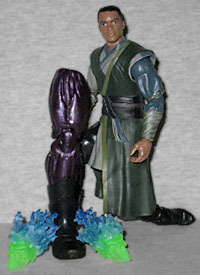 Of course, the figure also has bits of this series' Dormammu Build-A-Figure. Specifically he has the right leg and two flaming skulls. The skulls are green with blue flames on them, and actually look quite cool that way. The leg is a leg, and will be joining the rest of the BAF pieces. It was weird accepting Karl Mordo as a good guy in Doctor Strange, but the movie made it work. And this is the first time any version of the character has received an action figure, so good for him! And good for us, too.